Jerome Glisse has long been involved with open-source Linux graphics drivers, but in recent months he hasn't announced any major breakthroughs like in past years. However, at Red Hat they have struck up a partnership with NVIDIA to work on a new device-agnostic API for the Linux kernel that can benefit the graphics drivers. The Olympics have become a measuring stick for online broadcasters: How much more can they stream than two or four years ago? How much can they up the quality? For the BBC, the 2012 Olympics proved a special challenge since London was the host. It was a busy year for the BBC. Last week, at IBC 2013, the EBU published the first release of its QC Criteria (EBU Tech 3363) developed by its Strategic Programme on Quality Control. EBU Tech 3363 is a large collection of QC checks that can be applied to file-based audiovisual content. Examples include the detection of visual test patterns, loudness level compliance checks, colour gamut verification, looking for image sequences that may trigger epileptic seizures, etc. This collection of QC tests can be seen as a 'shopping list' which media professionals can use to, for example, create their own delivery specifications or establish test protocols for archive transfer projects. We all know this is going to end in a bloodbath. Look around far and wide, and you won’t find a single comprehensive comparison of every major video editing software. So, I decided to put one together myself. This article is the result of months of hands on experience with each and every one of the applications mentioned here. I’m taking no prisoners. There will be one and only one winner. The Alexa XT and Alexa Classic with the XR recording module both have the ability to read ASC CDL (Color Decision List) LUT settings as they record. This means that, over Ethernet, the camera can take in a Look and store it in the Raw footage as metadata. This is done by enabling a CDL server on the camera and then sending in CDLs with different software programs. This CDL can then be applied to the Raw footage through post or when downloading with the Codex UI. Watch the video above to see how I use this great option with Pomfort’s LiveGrade software and the Codex Raw workflow. With a new audio core, hardware decoding and encoding, port to mobile platforms, preparation for Ultra-HD video and a special care to support more formats, 2.1 is a major upgrade for VLC. Rincewind has a new rendering pipeline for audio, with better effiency, volume and device management, to improve VLC audio support. It supports many new devices inputs, formats, metadata and improves most of the current ones, preparing for the next-gen codecs. Rincewind fixes around a thousand bugs, in more than 7000 commits from 140 volunteers. Beamr’s CTO, Dror Gill, emphasised that Beamr Video is not a new type of video compression codec: instead it controls existing video compression systems like H.264 or HEVC, manipulating the encoding process in such a way that, in effect, it lowers the threshold at which bit-rate reductions cause artefacts visible to the naked eye. (Amsterdam--September 19, 2013) At IBC 2013 Quantel introduced a truly revolutionary concept - stream-based workflows. Just as file-based workflows replaced video, stream-based workflows are the next giant stride forward for our industry, moving beyond the limits of files to allow content to be accessed from anywhere, in any form, instantly. With the fall of Megaupload, legal VOD sites are quickly gaining back popularity as consumers are eager to watch fresh video contents on all their connected devices. If you are a content owner, a TV channel or a telco, it may be the right time to (re)launch you Multiscreen OTT VOD offer. This post intends to start from the reference tech choices in this game – Netflix’s ones – explain the major challenges of such type of service and the associated DRM issues, and finally drive you throughout the different market options you have to setup your own service on a close basis (this part is covered in part 2 of the post). Everything would have been easier if Netflix did sell its solution as a white label platform, but it’s not (yet) the case, so this leaves fun territories to explore ! This year at IBC, I was invited by Vimond to take part into their Industry Visionaries talk series and discuss “The Future of OTT Platforms: Is it Diversification or Standardization ?” with Eric Schumacher-Rasmussen, Editor of Streaming Media Magazine. Although the 45 minutes talk was already quite consistent (and certainly took a share in my voice disappearing the day after) and shall be available online soon on Vimond’s website, I thought I could take the occasion to go over the topic here also, as a follow-up of some general guidelines I previously exposed in “How to build a Netflix-like multiscreen OTT service (part 1)“. Good news! Avid just released Media Composer 7.0.2 and in this blog post I want to share some of the changes and improvements that come with this release. Aside from that, it is worth mentioning that there are more than 70 bugs fixes. Media Composer 7.0.2 and NewsCutter 11.0.2 can be found in the Avid Download Center. Facilis TerraBlock 6.0 shared storage, previewing at IBC 2013, will soon be updated with more integration for third-party application workflows, automated archive management with LTO 6 support and support for Adobe Anywhere. The VLC project has merged support for x265 to provide support for HEVC/H.265 in the popular open-source cross-platform media player. EditShare®, the technology leader in shared media storage and end-to-end tapeless workflow solutions, will be demonstrating its Lightworks Pro editor running on Mac, Linux and Windows at IBC2013 (stand 7.B26). The tri-platform editor has reached a groundbreaking 600,000+ registered users and is the tool of choice for editors working on a wide range of critically acclaimed films. “With a sizeable and very active Lightworks community behind us, we have an enormous amount of valuable feedback and are able to aggressively develop Lightworks with distinctive features that resonate with the editing community,” states Matthew Sandford, global product manager, Lightworks. EditShare’s Lightworks R&D team drives some 26+ public beta cycles and aims to push out four major releases per year. In the Broadcast and Connected Systems team here in R&D one of the things we have been looking at for a few years is adaptive bitrate technology. Recently the main focus in this area has been MPEG DASH, what profile of it to use, and how we can create content using it. The reason for today’s post is to introduce the first piece of test material we have created. Apple has released 10.8.5, which has stability improvements for Xsan. Hopefully the files out of sysnc on different clients bug is gone. Let us know how upgrades go in the comments section. Amsterdam, September 12, 2013 –Vision Research, a leading manufacturer of digital high‑speed imaging systems, officially launches the Phantom® Flex4K, the next evolution in its award-winning digital cinema product line at the 2013 International Broadcasting Convention, September 13-17, 2013 in Amsterdam. The Phantom Flex4K offers exceptional image quality, new workflow options, a user-friendly camera control interface, and outstanding performance at both ultra high-speed and standard frame rates. 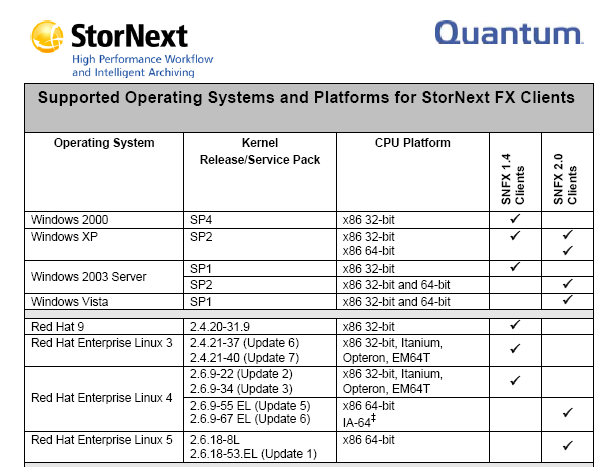 Quantum announces latest version of Stornext, coming as appliances end of 2013. 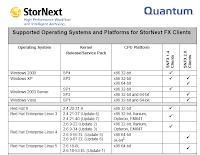 Software only packages available Q1 2014. DisplayLink's been wringing all kinds of connectivity out of our computer's USB ports for years, turning one connection into many. It should come as no surprise, then, that the company's using its considerable compression expertise to send high-resolution 4K video through that very same pipe. Ideally, the system shoots video over USB 3.0, while still giving users the full connectivity options of any compatible DisplayLink device -- but it can also function using USB 2.0, though the dynamically compensating data compression at work may cause some frames to drop. In Part One and Part Two we ran the numbers on each RAID level to find out how well they performed on speed, capacity and failure rates as the drive sizes increased. In this final part we’ll try to put together a few rules of thumb to help guide us in selecting the right RAID level for video editing or post production. At IBC, Adobe has announced major updates to Adobe Video apps in Creative Cloud, which should be available in mid-October. This comes after Premiere Pro CC got 25 new features + bug fixes in a July update. Regular subscription updates do seem to be coming as expected, making it easier to use and digest changes. Ever wondered how the Canon 7D REALLY looks like next to an Arri Alexa or Sony F65? This video brings you the answer. We took these shots from our extensive Beauty Filter Test which we will publish tomorrow and placed them side by side so you can get a feeling for how the cameras compare in the studio setup we had. Note that this is not a thorough camera review, but just an opportunity to watch the same high detail, high dynamic range scene on these 6 cameras with the same high quality PL lens and the same lighting, graded professionally to match. Please make sure you download the source clip. If your storage system talks only about IOPS, bandwidths and latencies, with no mention of supported stream counts, you are probably looking at a storage system designed for enterprise IT applications; not real-time media editing. There is a concept in the 2013 releases of Smoke and the 2013 Extension 2 release of Flame Premium of WORKSPACES. Workspaces allows 2 or more different Smoke or Flame systems to access and work on the same project at the same time, using the same clips. In the Project hierarchy, a Workspace will fall in-between the Project and the Media Library. Each Smoke or Flame system connected to the same project at the same time, will create it’s own workspace. One of the things about Magic Lantern Raw is the need for a middle man, an app that can re-encode the .raw files into .dng files that most editors can support. But quietly working in the background, there’s a plug-in called Ginger HDR for Adobe products that will allow bypassing of re-encoding of the files and use .raw files directly. Providing the widest range of content, from managed Broadcast/Broadband to web video content, can position pay TV operators in a unique place aggregating mainstream premium content with long tail content on a single device. Rapid integration of new technologies is becoming essential for set top boxes as pay TV operators migrate their software platforms to newer boxes for extra power or additional capabilities. The best way to enable accelerated development and hardware portability is to exploit the dynamic and innovative resources of the open source development community. Telestream and MulticoreWare have made available an open source H.265, or HEVC encoder. The two companies developed the new x265 project aiming to create a very efficient, high quality H.265 codec. Conceived by Telestream, the x265 initiative was co-founded and is being managed by MulticoreWare as a development partner, and is being introduced under both an open source and commercial license model. New HDMI 2.0 functionality includes: 4K 50/60, (2160p), which is 4 times the clarity of 1080p/60 video resolution Up to 32 audio channels for a multi-dimensional immersive audio experience Up to 1536kHz audio sample frequency for the highest audio fidelity Simultaneous delivery of dual video streams to multiple users on the same screen Simultaneous delivery of multi-stream audio to multiple users (up to 4) Support for the wide angle theatrical 21:9 video aspect ratio Dynamic synchronization of video and audio streams CEC extensions provides expanded command and control of consumer electronics devices through a single control point. I’ve been talking a lot about offline/online workflows lately — how they have, in principle, been used for ages, and still play today, tape or no tape. Such a post production process allows less fortunate folks (such as myself) to work with footage like Blackmagic Camera CinemaDNG and Magic Lantern RAW on hard-pressed machines. In Part One and Part Two we listed the components of a SAN storage system. In this final part we’ll look at the cost of putting together a DIY SAN, and then compare some of the well-known names that provide SAN solutions that are video-centric.